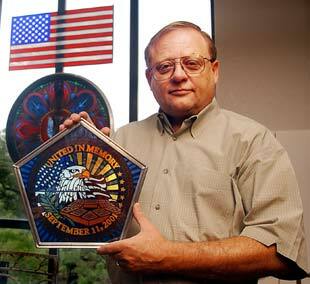 Glass artist Dennis Roberts holds a replica of the Pentagon Memorial Window, which he created in remembrance of Sept. 11. Roberts adapted a patriotic Pentagon design to glass and added 184 pieces of red glass in two circles to represent each person killed in the terrorist attack on the Pentagon last year. 'It was a real honor for me to do this,' he said. FREDERICKSBURG — Stained glass and other glass art designed by Dennis Roberts graces churches, mosques and synagogues across the nation. But a window he donated to the Pentagon evokes a sense of light, color, memory and patriotism that stands apart from his previous work. Five-sided like the Pentagon, the window is the focal point of a memorial chapel built in the outer ring of the Pentagon at the fourth corridor — the area where an airliner commandeered by terrorists crashed exactly one year ago. Ten thousand people will attend a Defense Department memorial ceremony at the Pentagon today. President Bush will speak. Afterward, relatives of the civilians and military personnel killed by the crash of American Airlines Flight 77 will visit the chapel to see the window for the first time. A formal dedication of the chapel and window will be scheduled later. The Pentagon Memorial Window measures 5 feet from point to point and is based on a logo designed by Defense Department artists for a memorial service held in October 2001. The window's images are familiar icons: a bald eagle, an olive branch, an American flag and the Pentagon. The phrases "United in Memory" and "September 11, 2001," are spelled out in amber. Roberts adapted the design to glass by modifying colors and shapes, and added 184 pieces of ruby red glass in two circles to represent each person killed in the terrorist attack on the Pentagon. Altogether, the window consists of more than 500 pieces of inch-thick faceted glass, called Dalle de Verre, that were cut by hand and hammered on the edges to expose layered surfaces on which light plays. The window is so heavy — about 250 pounds — that it had to be made in two sections. Roberts, the founder and president of IHS Studios in Fredericksburg, was chosen for the project not only because of his artistic skill, but because of his unusual approach to final assembly. Lt. Col. Eric Wester, an Army chaplain, observed Roberts' approach at a conference of the Evangelical Lutheran Church in America in Indianapolis a month before the terrorist attacks. Roberts had church leaders put pre-cut pieces of colored glass into place for a window later installed at a church in Kentucky. When Wester approached Roberts about a window for the Pentagon, Roberts offered to undertake the project for free. He also donated 12-inch replicas to the victims' families. "I was nine years in the Marine Corps Reserves," Roberts said. "It was a real honor for me to do this." Roberts, 55, founded his glass art company 20 years ago after a career in airline cargo sales. He has 12 employees. He and his son, David, who is the company's vice president, will attend the Pentagon ceremony today. On Monday, at his studio amid cedars and oaks in the Hill Country, Roberts recalled the most poignant moment of the project. It was in March, when about 400 Army chaplains and assistants representing various faiths met in Hilton Head, S.C., and placed numbered pieces of glass into designated positions on a pattern. Then epoxy was poured to form the joints between the pieces. Tears flowed as well. "A lot of them were holding their pieces of glass and praying," Roberts said. "It was a very uplifting time. 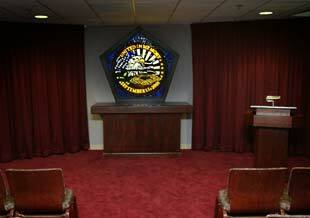 I guarantee you every chaplain can walk up and point out his piece of glass." Wester, who aided victims within 10 minutes of the crash at the Pentagon, participated in the assembling of the window. "Dennis is a remarkable man, as a churchman and as a patriot," Wester said. "Part of my motive in contacting Dennis was an awareness that so much of our true spiritual peace and healing is beyond words. "For me, being able to commit something to a work of art leaves a lasting sense of connection and hope — hope in the sense that future generations will see the light that comes through this window and recognize the service and sacrifice of so many who have gone before us." Presented by The Austin American-Statesman. Contact us. © Copyright Cox Interactive Media, Inc.2001 All rights reserved.